Our van ramps come in two styles and three widths and in many cases are much less expensive than van conversions or hydraulic lifts. 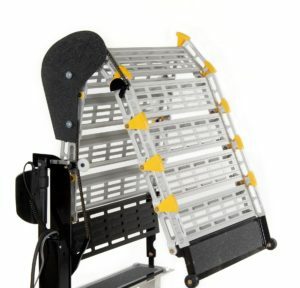 $1,400.00 for a Roll-A-Ramp An affordable option – fits into many factory vans. 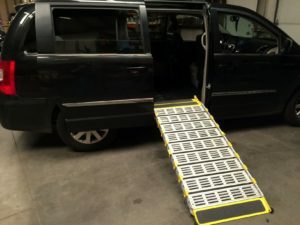 The perfect van access solution for those looking for an economical option for wheelchair or scooter ramps. 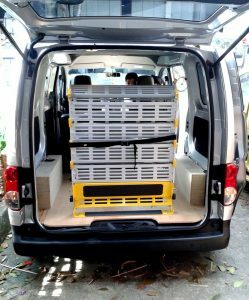 The manual folding ramp folds out of the van door to the ground. 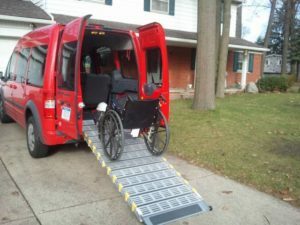 Powered van ramps are affordable because they can fit into many existing vans with only 2 – 4 hours of installation time. There may not be a need to buy an expensive conversion van. 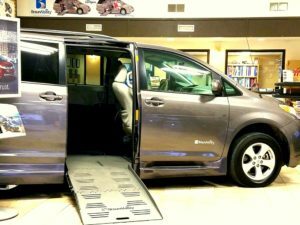 Because van styles and models are changing every year, please call us or one of our excellent dealers to determine if your vehicle is compatible with our ramp. Side view of powered ramp. Starting at $2,595.00. Powered ramp occupies approximately 1 foot of interior space. Check out Pricing and Application here. Check out the Van Ramp Flyer here. Also, many van manufacturers offer rebates or programs to support installing van ramps. Click below to learn more about their mobility rebates.